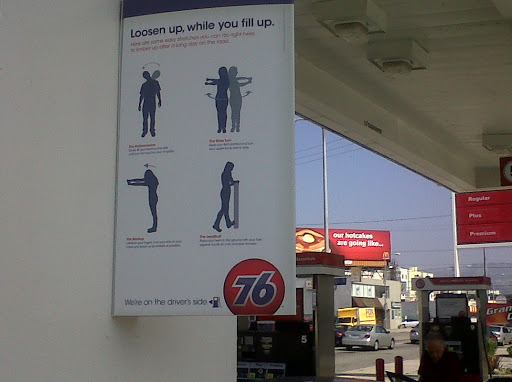 Paul pointed out this sign today as we were buying fuel. Just a reminder that you can do little exercises while you wait for your tank to fill. Though I wouldn’t suggest breathing too deeply next to the gas fumes. My dad used to do that calf stretch when we would stop on road trips. He actually probably still does that. really interesting. is this a california thing or american thing? does it reflect some sort of fundamental shift in societal values/how americans are living (due to the recession, perhaps)? what is the message of the sign? (or maybe i'm reading too much into it).